1. Oleg Trutnev and Nikolai Sergeyev article headlined "Alcohol to be returned to fans" says that the Federal Service for Regulating the Alcohol Market has suggested lifting a ban on selling beer at stadiums during football games; pp 1, 10 (680 words). 2. Irina Nagornykh et al. report headlined "People of labour to join Public Chamber" says that President Putin has sent 40 invitations to new members of the Public Chamber, most of them being representatives of professional unions and the All-Russia People's Front; pp 1, 3 (827 words). 3. Anastasia Fomicheva article headlined "Social peace better than norm" says that the government has allowed regions to postpone the introduction of social electricity norms for two years having made a difficult choice in favor of social stability; pp 1, 9 (546 words). 4. Olga Shestopal and Svetlana Dementiyeva article headlined "Depositors thrown out of line" says that the idea to allow major depositors of bankrupt banks to get their money back before the Deposits Insurance Agency has been excluded from the amendments to the law on bankruptcy; pp 1, 8 (755 words). 5. Petr Netreba and Dmitry Butrin article headlined "State companies asked to report in advance" says that state companies will be obliged to get the government's approval for their investment programs; p 2 (557 words). 6. Alexei Shapovalov article headlined "Russia moving to regulating emissions" says that the Economic Development Ministry, Business Russia and the Russian Union of Industrialists and Entrepreneurs have come to agreement on the draft governmental resolution on the measures aiming to keep greenhouse gas emissions by 2020 as high as 75 percent of the level of 1990; p 2 (611 words). 7. Andrei Kolesnikov article headlined "Solemn Kamaz held in Novo-Ogarevo" gives account of President Putin's meeting with the winners of the Dakar rally; p 3 (909 words). 8. Yulia Rybina article headlined "Accomplices of suicide bombers found" says that Dagestani law-enforcers have detained two accomplices of suicide bombers responsible for blasts in Volgograd in late December; p 4 (561 words). 9. Sergei Strokan interview with Ukrainian president's advisor Anna German headlined "'President ready to run in election tomorrow already'" where she speaks about the scenario of settling the crisis Ukraine's ruling party suggests; p 5 (559 words). 10. Maria Yefimova article headlined "PACE finds those to blame for Ukraine" says that PACE has passed a tough resolution laying the blame for the crisis on the Ukrainian authorities and accused Russia of 'economic and political blackmail'; p 5 (444 words). 11. Ilya Barabanov article headlined "Maidan does not leave under amnesty" says that protesters in Kiev are not going to leave Maidan until an early presidential election is announced; p 5 (498 words). 12. Yelena Chernenko article headlined "Exchange conditions not chosen for spies" says that the Anschlags spouses convicted in Germany for espionage in favor of Russia remain in Germany as the exchange Moscow and Berlin were discussing has not taken place; p 5 (712 words). 13. Dmitry Tratas article headlined "Rules of game" comments on the last session of the Federal Reserve System chaired by Ben Bernanke; p 7 (391 words). 1. Ivan Rodin article headlined "Alexander Bastrykin gets down to truth" says the head of the Investigative Committee, Alexander Bastrykin, has drafted a bill reducing the role of the presumption of innocence; pp 1-2 (817 words). 2. Alina Terekhova article headlined "Sinking ruble hits at Nabiullina" says that the Central Bank blamed the outflow of capital from developing countries for the significant weakening of the Russian currency and tried to explain its policy on currency regulation' pp 1, 4 (941 words). 3. Tatyana Ivzhenko article headlined "Viktor Yanukovych may dissolve parliament" says that the amnesty bill the Ukrainian parliament passed has failed to settle the crisis and signal a compromise between the sides. By mid February the confrontation may aggravate and result in the dissolving of the parliament; pp 1, 7 (932 words). 4. Yekaterina Trifonova article headlined "History to be studied by guidelines" says that President Putin has approved the concept of a single History textbook for schools. Meanwhile, next year History teachers will be faced with a challenge: teach the subject using old History books but keep in mind the new concept; pp 1, 3 (495 words). 5. Anton Khodasevich article headlined "Russian money, Belarussian scenario" says that Belarusian President Alexander Lukashenko warned yesterday that Moscow should abandon hopes to buy Belarusian industrial companies cheap and easy and that joint integration projects would be implemented under the Belarusian scenario only; pp 1-2 (450 words). 6. Yevgeny Grigoriyev article headlined "Munich talk on security" looks ahead at the Munich Security Conference to open today; p 1, 8 (667 words). 7. Editorial headlined "Citizens want to depend on 'suspicious' authorities" says that polls conducted by Levada Centre show that although 67 percent of Russians do not believe that the interests of the authorities and society are the same, 53 percent of the polled think the state must take care of its citizens. The authorities, which have been increasing their social obligations in order to attract voters, think they control society, whereas society believes it can control the authorities as regards the most important issues; p 2 (514 words). 8. Oleg Vladykin article headlined "Our 'frontiers' make U.S. increasingly concerned" quotes an article by The New York Times which says that Russia's tests of a new ground-launched cruise missile are raising concerns about Moscow's compliance with a landmark arms control agreement; p 2 (717 words). 9. Alexander Knyazev article headlined "Carte blanche. Kyrgyzstan's Arab vector" comments on the visit of Saudi Arabian Prince Khaled Bin Saud Bin Khaled Al Sa'ud to Kyrgyzstan. Ryadh is stepping up cooperation with Bishkek striving to create conditions for establishing Wahhabism in Kyrgyzstan, which will definitely prevent its integration with Russia, experts comment; p 3 (873 words). 10. Alexei Gorbachev article headlined "Civil Platform calls for integration with Europe" says that the Civil Platform party founded by tycoon Mikhail Prokhorov has stated that Moscow's policy caused the crisis in Ukraine and a scenario similar to the one unfolding there can now be implemented in Russia. In addition, the party emphasized the need for integration with Europe and suggested trying the integration in Kaliningrad region first; p 3 (599 words). 11. Igor Naumov article headlined "Eurasian Economic Community requires insurance guarantees" says that the decision on setting up a single insurance market made by the members of the Eurasian Economic Community over four years ago still remains a declaration of intention and looks at the reasons hampering integration; p 4 (647 words). 12. Dmitry Orlov article headlined "Russia's one hundred leading politicians in January 2014" features a rating of Russia's most influential politicians in January; p 5 (1,564 words). 13. Yury Roks article headlined "Los Angeles recognizes Karabakh's independence" says that the Los Angeles City Council has passed a resolution on the recognition of the republic of Nagorno-Karabakh. The move will not lead to any legal or political consequences, experts comment; p 7 (526 words). 14. Viktoria Panfilova article headlined "General Dostum goes to historical motherland" says that leader of ethnic Uzbeks in Afghanistan and chairman of the National Islamic Movement of Afghanistan General Abdul Rashid Dostum has visited several Central Asian countries ahead of the April 4 election striving to secure their support; p 7 (978 words). 15. Yury Paniyev article headlined "Geneva 2's failure fraught with Syria's breakup" says that the role of Russia and the U.S. in the talks on the Syrian crisis settlement is increasing as the first round of Geneva 2 is closing today; p 8 (781 words). 16. Yevgenia Novikova article headlined "Snowden scarier than terrorism" says that director of U.S. National Intelligence James Clapper has stated that people like former NSA employee Edward Snowden are more dangerous than international terrorism and asked Snowden to return the classified documents he had managed to copy; p 8 (630 words). 1. Alexei Nikolsky article headlined "Olympic security army" says that more than 70,000 law-enforcers will ensure security during the Sochi Olympics; pp 1, 3 (650 words). 2. Dmitry Kazmin and Alexandra Terentiyeva article headlined "Deposits from Strzhalkovsky" says that the Bank of Cyprus has opened access to deposits worth some 900 million euros ($1.2 billion); pp 1, 15 (420 words). 3. Editorial headlined "Wooden economy" looks at the consequences of the weakening of the ruble; pp 1, 6 (320 words). 4. Alexei Nikolsky et al. report headlined "Objective truth in Duma" says that the State Duma is to consider amendments to declare the establishment of objective truth the goal of criminal courts; p 2 (500 words). 5. Svetlana Bocharova article headlined "Rehabilitation of law on Nazism" says that amid the row over a controversial World War II poll posted by satellite and internet broadcaster Dozhd television, lawmaker Irina Yarovaya is going to try to push her bill on criminal liability for criticism of the actions of anti-Hitler coalition's troops; p 2 (450 words). 6. Anastasia Korniya article headlined "Sochi not for activists" says that two civil activists, who were denied 'a passport of fan' required to attend Olympic events in Sochi, filed a suit against the Sochi-2014 organizing committee; p 3 (330 words). 7. Sergei Titov and Alexei Nikolsky article headlined "Law-enforcers' revolt" says that the Federal Anti-Monopoly Service has suggested limiting law-enforcers' powers to launch criminal cases for antimonopoly violations; p 4 (540 words). 8. 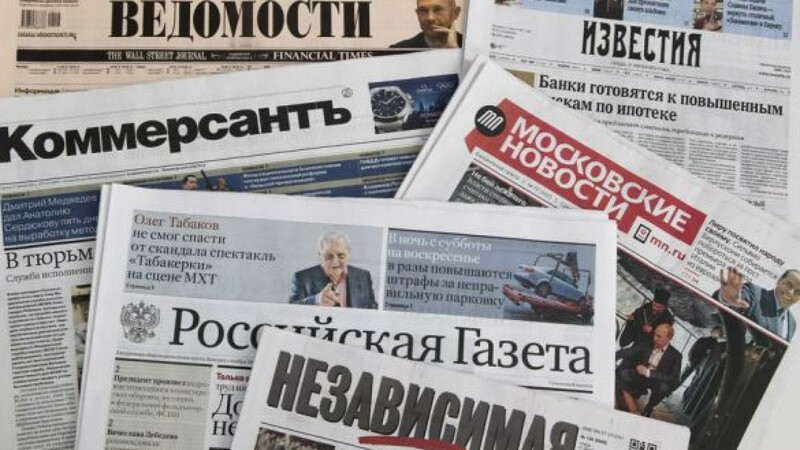 Editorial headlined "To spank Dozhd" slams the authorities' attempts to portray the campaign against satellite and internet broadcaster Dozhd television as solely the reaction to wide public indignation over its controversial poll on the Siege of Leningrad; p 6 (230 words). 9. Ksenia Boletskaya article headlined "Thing of week. Remote control" comments on Dozhd television losing access to its audience and says that the authorities have demonstrated how the operation of a mass media outlet can be stopped in one day without involving the court or supervising bodies; p 7 (200 words). 1. Interview with Deputy Telecommunications and Mass Communications Minister Alexei Volin headlined "Masters of Doom" where he speaks about the anti-piracy law and regulation of the internet; pp 1, 6 (1,000 words). 2. Yevgeny Shestakov article headlined "Neither war nor peace" looks at recent developments in Ukraine and says that the EU keeps trying to influence the situation; p 8 (720 words). 3. Maxim Makarychev article headlined "Maidan in winter clothes" says that amid strong winds and frosts Maidan is determined to continue the siege; p 8 (300 words). 1. Ivan Cheberko article headlined "Russian Space Systems to get new head" says that the current head of the Russian Space Systems appointed less than a year ago will be replaced by Alexei Smirnov currently working at the Transport Ministry; pp 1, 4 (542 words). 2. Yanina Sokolovskaya article headlined "Maidan and Berkut to fight at football grounds" says that the president of Kiev's Dinamo football team has proposed 'a reconciliation match' between representatives of Maidan and Berkut riot police; p 7 (460 words). 3. Konstantin Volkov interview with head of Russia's delegation at PACE Alexei Pushkov headlined "'Ukrainian delegation may be deprived of powers at PACE'" where he speaks about the resolution on the situation in Ukraine passed by PACE; p 7 (430 words). 4. Kirill Benediktov article headlined "Diplomatic success instead of modest dinner" looks at the outcomes of the Russia-EU summit, the agreement to use 100-per-cent capacity of Gazprom's OPAL system being Russia's main breakthrough; p 9 (1,236 words). 5. Vitaly Sirotinin article headlined "'Potential rival' behind doping scandal" looks at who will benefit from a scandal over doping use by Russian biathlon athletes ahead of the Sochi Olympics; p 11 (404 words). 1. Leonid Berres article headlined "Five rings on price tag" says that it is very expensive to go to Olympic Sochi, for example 10 days will cost about $5,500; pp 1, 18 (700 words). 2. Irina Badmayeva and Nikolai Makeyev article headlined "ruble has 'wooden' brain" says that despite that the ruble continues to fall, the authorities repeat that there are no reasons to worry; during informal conversations, however, they admit that the weak ruble is the result of a number of the government's mistakes; p 2 (350 words). 3. Yekaterina Petukhova article headlined "Maidan forever?" says that Ukrainian opposition leaders urge activists not to disperse and continue protests; p 3 (600 words). 4. Oleg Bazak article headlined "Hetmans quarrel, lackeys' forelocks crackle" says that Ukrainian President Viktor Yanukovych's proposal to appoint opposition leader Arseny Yatsenyuk as prime minister, allegedly aimed to reach a truce with opposition, has had an opposite destructive effect; p 3 (360 words). 5. Matvei Ganaplosky article headlined "Law above everything" comments on the row over a controversial poll posted by the liberal channel Dozhd and says that the situation is more complicated than it seems; p 3 (450 words). 1. Yulia Latynina report "Let us disconnect Dozhd, organize drought" says that the head of the Russian cable television association has suggested that the television channel Dozhd be disconnected from cable broadcasting on the pretext of a poll aired by the channel on the Soviet military tactics during the siege of Leningrad in World War II. A powerful information barrier between Russia and the world is being built slowly but surely, article says; p 2 (650 words). 2. Newspaper publishes a brief statement of the Russian PEN Centre on "harassment" of the television channel Dozhd; p 2 (100 words). 3. Dmitry Bykov interview headlined "'Medvedev was not going to work for us'" with Dozhd general director Natalia Sindeyeva who says that the poll conducted by Dozhd is used as a pretext to "sort the television channel out"; p 3 (900 words). 4. Alexander Lebedev report "On revolutionary consciousness and common sense" looks at the conflict in the RPR-Parnas party; p 5 (1,100 words). 5. Alexander Mineyev report "Strategic failure to tell everything" comments on the recent Russia-EU summit and refers to it as the "strangest summit". They spoke about Europe, but meant Ukraine, article says; p 5 (1,000 words). 6. Alexei Polukhin report "Concise currency rate" looks at the causes of the depreciation of the ruble observed in January; p 6 (1,300 words). 7. Irina Petrovskaya report "Blockade for siege" looks at the row over the television channel Dozhd; p 32 (1,200 words). 1. Alexander Litoi et al. report "Devaluation does not stimulate" looks at the depreciation of the ruble and says that Russian businessmen are inclined to trust Economic Development Minister Alexei Ulyukayev who warned as back as last summer that the weak ruble would not help the Russian economy; pp 1, 3 (1,300 words). 2. Ivan Petrov report "Business complaints" says that business ombudsman Boris Titov is preparing his first report for Vladimir Putin on the condition of entrepreneurs' rights in the country; pp 1, 3 (800 words). 3. Alexander Litoi report "Kiev is off sick" says that the Ukrainian authorities and the opposition have failed to come to agreement again. President Viktor Yanukovych, instead of signing the law on amnesty, took a sick leave, article says; p 2 (600 words). 4. Alisa Shtykina report "There is no payment" says that bailiffs are deciding what to do with former Yukos head Mikhail Khodorkovsky's "debts"'; p 2 (650 words). 1. Artyom Lunkov interview headlined "Authorities launch offensive against independent mass media" with prominent television journalist Nikolai Svanidze who comments on the campaign against the television channel Dozhd; pp 1-2 (550 words). 2. Vardan Ogandzhanyan report "Boris Nemtsov wants lawmakers from ruling party to be imprisoned" says that Boris Nemtsov, a member of the Yaroslavl region duma and co-chairman of RPR-Parnas, has submitted to the local directorate of the Investigative Committee a complaint against 16 United Russia members of the local parliament; p 2 (250 words). 3. Yana Sergeyeva report "Truble in tents" says that agreements between the Ukrainian opposition and the authorities have not resulted in the cessation of confrontation; p 4 (850 words). 1. Vladimir Vorsobin report "'Guys from east fought against Berkut and guys from west are cowards'" looks at the situation in Ukraine and says that the opposition on Maidan is forming its own guards; p 4 (1,400 words). 2. Alexander Grishin report "Barring Russians" says that Russian journalists have not been allowed to attend the briefing of High Representative of the Union for Foreign Affairs Catherine Ashton in Kiev; p 4 (300 words). 1. Alexander Protsenko report "Is ruble plunging or flying low?" looks at the depreciation of the Russian ruble and features comments of Russian experts; pp 1, 3 (1,400 words). 2. Sergei Ilchenko report "In word and bullet" says that while the Ukrainian authorities and the opposition are maneuvering, "Maidan's militants" are killing policemen; pp 1-2 (1,100 words). 3. Sergei Frolov interview headlined "'Ukraine will never be the same'" with director of the Institute of CIS Countries Konstantin Zatulin who comments on the situation in Ukraine; p 2 (500 words). 1. Andrei Artamonov article "On the brink of civil war" comments on the situation in Ukraine; p 9 (2,100 words).